The Rebel Sweetheart. : Foodie Goodie | Confetti Cake. Christmas may be over and done with, but the festivities aren't because we still have the New Year (and New Year's Eve parties) to look forward to! 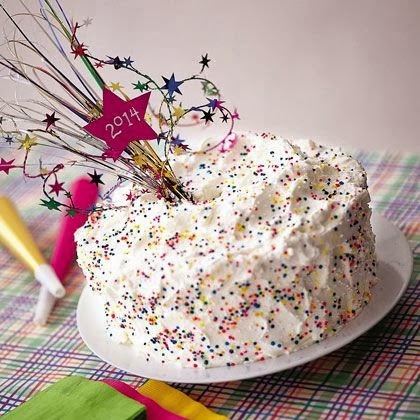 And if you're that kind of party host who likes preparing everything from scratch - from appetizers to entrees to dessert, here's a cake recipe that's sure to ring in the New Year with a bang! 1. Follow the directions on the cake mix box, but just before pouring the batter into the tube pan, add the sprinkles. 2. Mix them quickly and gently with as few strokes as possible and pour the batter into the pan immediately. If you mix and pour too slowly, the colors may bleed and color the surrounding batter. 3. Make the frosting right before you plan to apply it so that it doesn't set. For best results, apply the frosting, sprinkles, and decoration no more than an hour before serving. 4. Combine the gelatin and water in a small saucepan. Let it stand until thick. 5. Set the pan over low heat, stirring constantly until the gelatin dissolves. Don't let it boil, as that would reduce the gelling power of the gelatin. 6. Remove the gelatin from the heat. While it cools a bit, combine the cream, sugar, and vanilla extract in a bowl and whip them with an electric mixer until the mixture thickens slightly. 7. Gradually pour the liquid gelatin (don't let it set) into the whipped cream mixture and continue to beat at slow speed until blended. Then whip it at high speed until it's stiff and peaks form when you lift the beaters. 8. Frost the completely cooled cake with a generous, fluffy layer, making swirls and peaks as you go. 10. Store the cake in the refrigerator until ready to serve. Lovely cake! The design is perfect for this coming New Year's eve! I like simple directions like this to bake fun things. My 6 year old can help too, which is always a plus in our house! Thanks for sharing! Wala talaga akong talent magbake sis, pero kumain ng cake, meron hehehe. I like the cake's frosting, simple but festive. Oh, my! It looks so cute! I should take inspiration for New Year's, I was planning to make a cake.